Chocolaty, single-serving-sized, made-from-scratch Ghosts in the Graveyard Treats. These are a perfect Halloween dessert made with an easy no-bake chocolate cheesecake filling and Oreo Cookie crumbs! 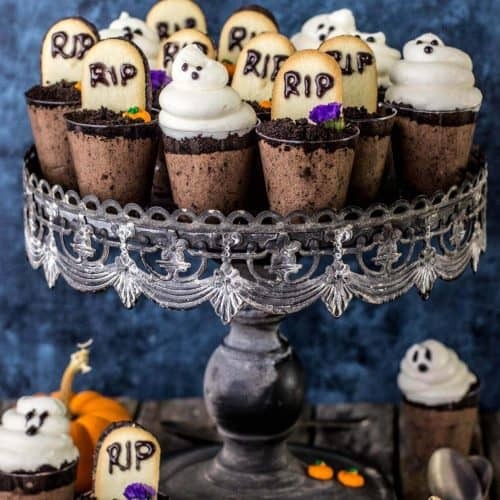 Top them off with cookie “tombstones” and whipped cream “ghosts”! Hi everyone! I originally shared this recipe over a year ago, but with Halloween a mere 11 days away, I thought you might appreciate a semi-spooky Halloween dessert. Honestly, I’ve hardly done any preparation for Halloween this year (aside from making these spider cookies last month). Our neighborhood is decorated with Jack o’Lanterns, spooky ghosts, and faux-spiderweb covered hedges, and all I have are three miniature pumpkins rotting outside our front window. Not exactly festive. 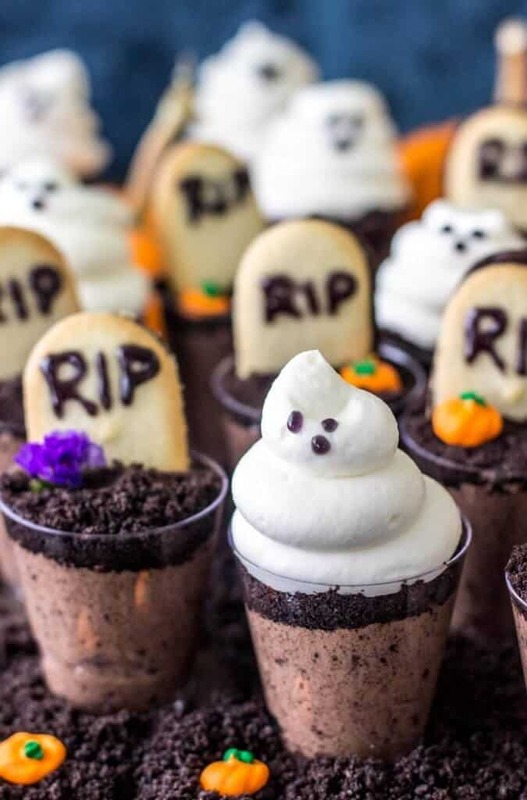 I thought that the very least I could do to try and get into the Halloween spirit was resurrect these Ghost in the Graveyard Halloween Dessert Shooters, a (non-alcoholic) chocolate cheesecake treat. My mom used to make “Ghosts in the Graveyard” when I was a kid, but it was done a little differently. 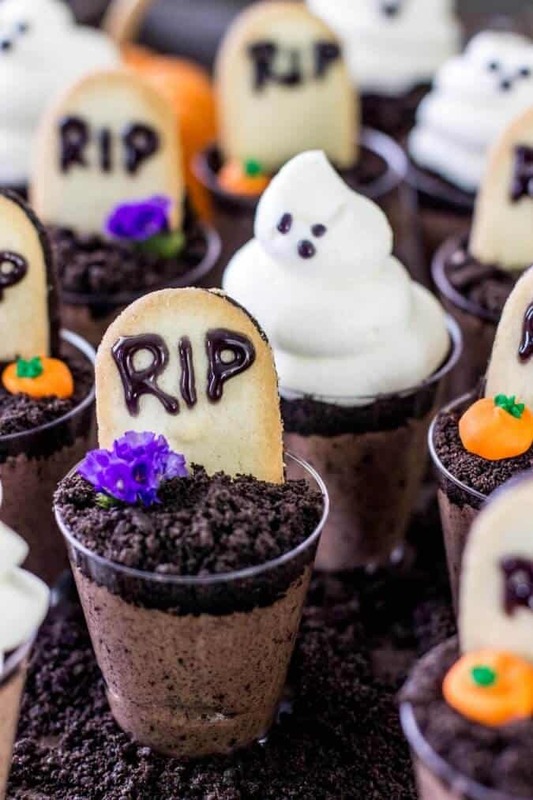 The classic dessert is made in a 13×9 pan (at least, it was in our house), the graveyard constructed of pudding and topped with cookie crumbs, cookie tombstones, and ghosts. I remember planting the Milano cookies in the pudding and then strategically carving out my slice of the “graveyard” so that I got both tombstone and ghost. 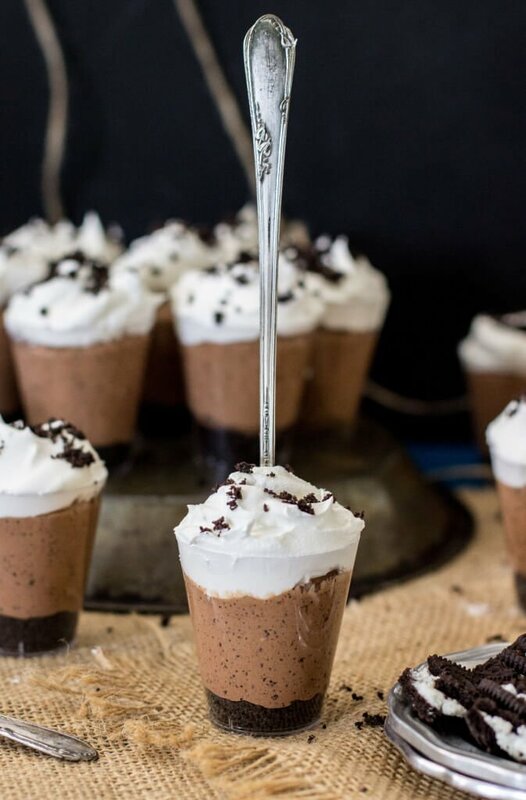 Given my affinity for mini desserts, and especially for dessert shooters, I individualized the dessert into adorable single-serving-sized portions. I made these treats from scratch mimicking the same chocolate filling that I used for my sister’s birthday cookie dough pie, only using a heavier portion of chocolate and stirring in crumbled Oreos for a “dirtier” look. It may seem like a lot of steps because you have to melt the chocolate separately, wait for it to cool, and whip the heavy cream at two different points, but it’s really pretty simple for a from-scratch Halloween dessert. It’s worth every extra dish, but I also included notes in case you wanted to speed things up a bit and substitute Cool Whip (I’ve done this a time or two myself, but it’s definitely worth the extra effort to make from scratch!!). Enjoy (and try not to look to closely at my ghosts in the background, they are sad specimen indeed)! Looking for another Halloween Dessert? Check out my adorable Spooky Spider Cookies! Chocolaty, single-serving-sized, made-from-scratch Ghosts in the Graveyard Treats. 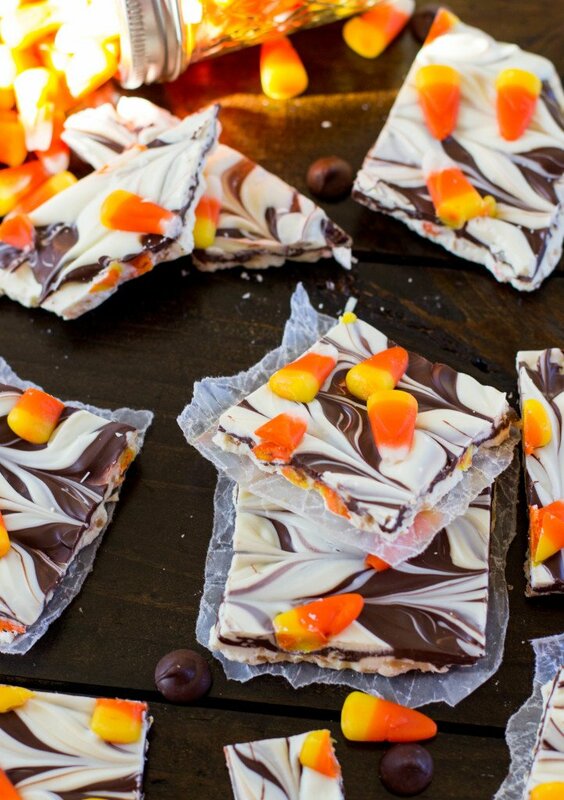 These are a perfect Halloween dessert! In a small saucepan, combine 1 cup chocolate chips and 1/2 cup of the heavy cream over medium-low heat, stirring frequently until chocolate chips are completely melted and mixture is smooth. Remove from heat and pour into a heatproof bowl. Stir in vanilla extract. Allow mixture to cool completely before continuing. In a clean, medium-sized bowl, use an electric mixer to beat remaining 1 1/2 cups heavy cream to stiff peaks. Set aside. In bowl of stand mixer, combine cream cheese and (cooled) chocolate mixture, stirring until completely combined. Gradually add powdered sugar until completely combined. Scrape down sides of bowl as needed. Stir in vanilla extract and 1 1/2 cups of the Oreo crumbs (reserve remaining crumbs to sprinkle over tops of shooters). Fold in whipped cream and then stir on low-speed until completely combined. Set out 24 disposable shot glasses. Pour mixture into large Ziploc bag, snip off one corner and pipe filling into shot glasses, filling about 3/4 full. Cover tops of each shooter with remaining Oreo crumbs. 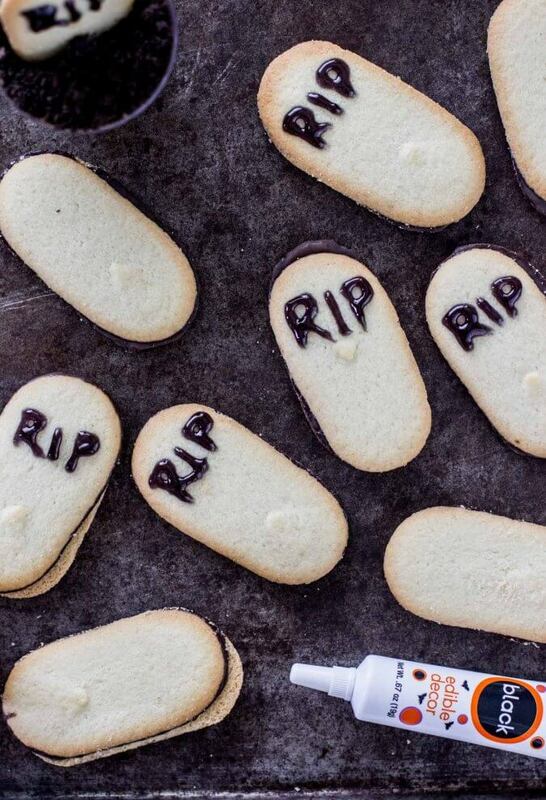 Prepare Milano cookies buy using black frosting to write "RIP" on upper half of cookie. Press Milano cookies firmly into half of the shooters so that only the half of the cookie reading "RIP" is protruding (like tombstones). Prepare whipped cream ghosts by combining heavy cream, powdered sugar, and vanilla in clean medium-sized bowl and whisking until stiff peaks form. (You may instead skip this step and use Cool Whip). Pour whipped cream (or Cool Whip)into large piping bag fitted with a large round tip and pipe ghost-shaped swirls on top of the remaininghalf of dessert shooters. 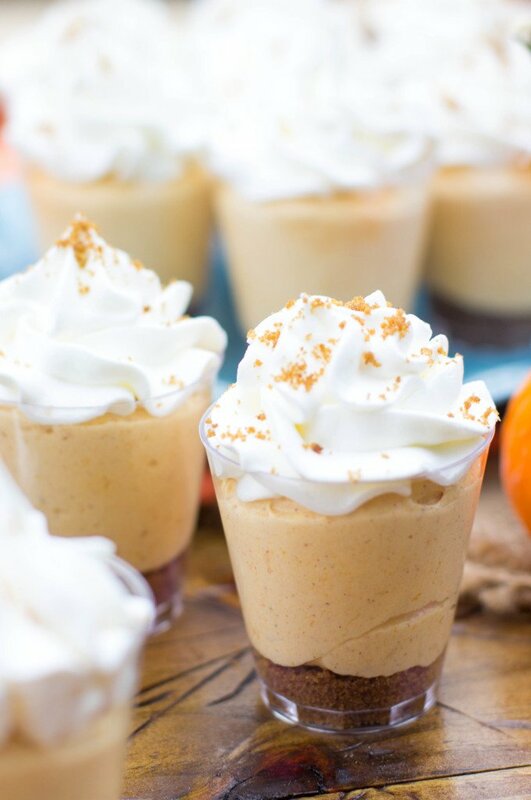 I ALWAYS BUY MY SHOT GLASSES HERE FROM AMAZON (affiliate link) *You may substitute 12 oz of Cool Whip for the 1 1/2 cups whipped heavy cream in the filling (you will still need the 1/2 cup for melting with the chocolate). **You can substitute additional Cool Whip to make these ghosts, if you prefer. This recipe makes enough for about 10-12 ghosts and is assuming you will top the rest of the shooters with cookie tombstones. You may double the recipe if you would like them all to be topped with ghosts. Do I pulverize the cookies with the cream? Or do I need to take the icing between the Oreos off? I am going to make these for a work party. If I make them the day before will the be ok to store in the refrigerator over night? And will they be ok to set out all day for my co workers? They will be fine made the day before! They’ll also be OK to sit out for even a few hours, but because of the dairy in them I wouldn’t recommend leaving them out all day, not more than a few hours. Awesome thanks! I have another question, what do you think about putting this in a large cake pan and just letting people scoop it out themselves? Would that also work? Did your whipping cream melt while they sat? I’m nervous that when I makes this that they melt. How long do you intend to leave them sit out? My whipped cream has never melted, but I know not everyone has been so lucky and if you are worried about it you could try using Cool Whip, which may be more stable. Hi, um what kind of chocolate chips does this call for? Semi-sweet? Thanks! Also, for the Oreo cookies, do you pulverize 28 whole cookies with the cream or 28 of the half without the cream? Where do you get those purple flowers and orange little pumpkins? Are they real or fake? The pumpkins were edible icing candies from my local cake shop, you could easily substitute those little mallow-creme mushrooms that come mixed in with candy corn. The flowers were real flowers, but they were mostly for decoration and I wasn’t sure if they were edible so I scraped them off before serving. I hope that helps!! These are so adorable! 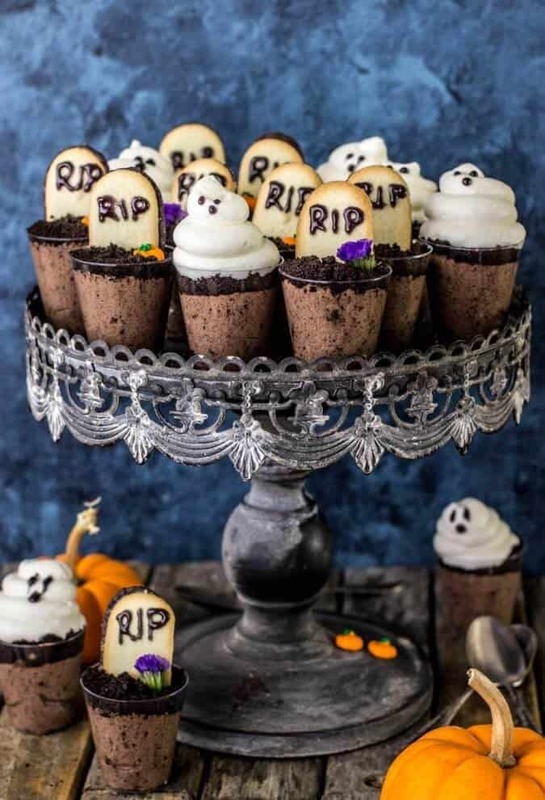 Can’t wait to make them for the girls(I work in a dorm at a private school) Do you think that the cool whip will hold better than the heavy cream for the ghosts? I’m sure they will be sitting out for a bit as the girls will be not all seeing them at the same time! So excited to make these for my work Halloween party on Monday!!! Can I make the filing the night before and pipe it into the shooters the day of? Also, any good ideas on transporting the shooters?? Thanks:)!!! Yes, you can definitely do that! The filling gets a little firm when chilled, so you may have to work it in the piping bag with your hands a bit to make it easier to pipe, but I have done this and it’s fine. The only way I’ve transported them is to fit them snugly in a tupperware or one of those disposable foil cake carriers, packing them in tight enough that they are all supporting one another (I hope that makes sense!). However, if you’re planning on making the filling in advance, it may just be easier to bring the shot glasses, filling, crumbs and toppers separately and assemble everything at your work, then you don’t have to worry about any of them falling over. I hope this helps! Thanks so much for your response – I’ll try one of those ideas for transport 🙂 can’t wait to taste them; I love Oreos so I’m pretty excited, haha. Do they have to be kept cold? Want to make them for my kids’ class party. Super cute!! Hi Heather! Yes, they should be kept cold. They won’t melt though and can be left out for a while (I wouldn’t leave out longer than 2 hours max). I’d put the ghosts on just before serving, or use storebought Cool Whip which will hold its shape a bit better for extended periods of time. Hope that helps! HI! Love everything about this. Where did you get the little flowers and mini pumpkins? Thank you! I bought the mini pumpkins from my local cake shop, they were sugar candy decorations, but I think if you were to buy some of those Brach’s mallowcream pumpkins (the kind you can get in the candy corn “autumn mix” bags) they would look super cute, too! For the flowers I just bought a bouquet from my local grocery store that had springs with small flowers in them, mine weren’t edible so they had to be removed before eating. Hope that helps! I want all the whipped cream ghosts!!! I just love how much fun this display is! Your presentation is top-notch! Keep those creative juices flowing! I love this presentation! Sooo creative! Great job!